Here’s what I use on a fairly daily basis: external hard drive, iPhone, iPad(s), gaming mouse, flash drive full of media and DSLR camera. Man or woman, I’m willing to bet you’ve got a similar load of peripherals that you use with your MacBook Pro or Air. With the MacBook’s two USB 3.0 ports, there’s never enough to go around when I want to plug in more than, say, two devices at once. Sure there’s two Thunderbolt ports, too, but I’m just not that fancy. Enter the Kanex simpleDock, a clever little brick of a device that turns one of the MacBook’s USB ports into three, and adds a shiny charging USB port to boot. Heck, there’s even a gigabit Ethernet port on the back, in case you need to connect to a (shudder) wired network. Now when I belly up to my standing desk to type at my MacBook, I just plug one USB cable into my MacBook Pro. Everything else is already connected; I’ve got my gaming mouse, high-capacity flash drive full of converted DVDs, and my backup hard drive all ready to go. 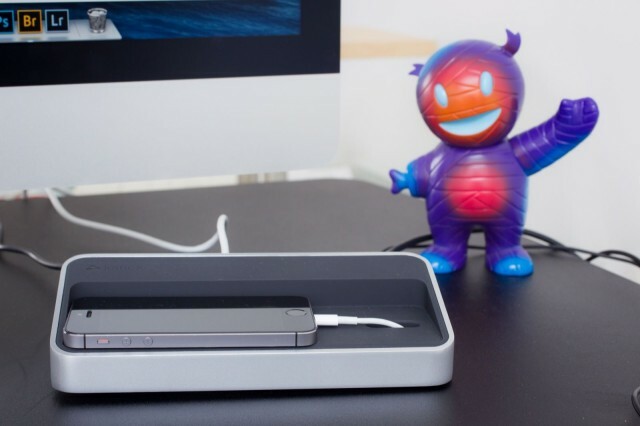 There’s a Lightning cable connected to the charging port on the back of the simpleDock, as well, letting me plug in my iPhone 5 and set it in the nonslip rubberized compartment on top of the dock to get it out of the way while charging. I don’t take the dock with me when on the go — it’s pretty heavy. At home, however, the brushed aluminum sides and dedicated iPhone spot make this laptop feel much more like a desktop, and that ain’t a bad thing. You can get the Kanex simpleDock for $119.95 at the Kanex website.